Love to see you there. If you can make it, sign up at itsmyseat.com/events/733971.html or call 626.869.7328. 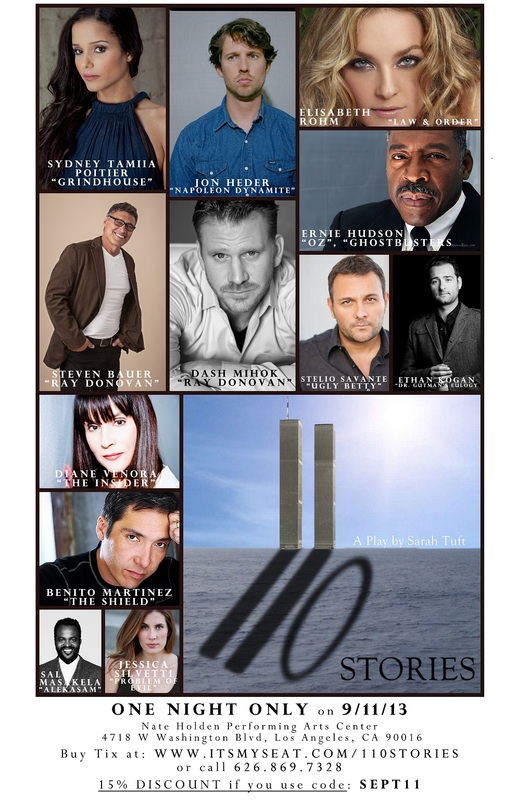 110 Stories Celebrity Benefit Performance will commemorate the 12th anniversary of the events of Sept 11th 2001. Sarah Tuft’s play expresses the human side of history, without politics and agenda, giving voice to those who experienced 9/11 directly.Proceeds from the event go to Operation Gratitude. All schedule permitting, the cast includes: Jon Heder, Ernie Hudson, Ethan Kogan, Anthony Ruivivar, Stelio Savante, Jessica Silvetti and Diane Venora. Directed by Rudolf Buitendach. Lead Producer: StelioSavante, Casting Director: Engine Media Group, Producers: Al Han, Ethan Kogan, Freddy Luis, Anne McCarthy, Kellie Gesell Roy, Jessica Silvetti.Consulting Producer: Michael Greenwald and Playwright Sarah Tuft. Special Note: Our charity Operation Gratitude will be providing tax deductible letters of receipt for everyone who purchases tickets. If you are unable to attend or do not live in LA, you can still purchase tickets/make a donation and you will receive the tax deductible letter from our charity. COME AND JOIN US, experience firsthand accounts of the events of Sept 11th 2001 with an illustrious cast and together we can raise money for this worthy charity. The performance starts at 8:00 p.m. with ticket prices ranging from $25 to $55. All ticket purchases and donations are tax-deductible.